Information on Subscribing to "needlepoint now"
This piece is part of a continuing project featured in the September/October 1999 issue of needlepoint now magazine. It is bold, colorful and suited for all stitching skills. This month we share with you one of the octagon patterns making up the design in two different color variations. 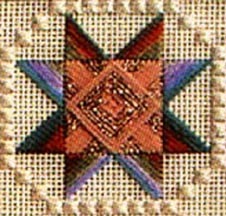 By combining the principle construction of two popular stitches, a new pattern is created in this interesting octagon. For a soft look begin by working the waffle stitch in the center of the octagon using 2 strands of Impressions # 3064 and work stitches 1 through 22. Then using 1 strand of # 16 braid - # 021 copper, work stitches 23 through 46. Finally, using 2 strands of Impressions # 3064 again, work stitches 47 through 62. To complete the pattern, work 8 units of Milanese stitch angled as shown in the Octagon C Chart. Work with 4 strands of Waterlilies # 061 or # 113. For a bold look, substitute 2 strands of Impressions # 3045 for the # 3064, and substitute 4 strands of Waterlilies # 048 for the Waterlilies # 061 or # 113 above. Use the Kreinik Metallic # 16 Braid color # 021 for whichever combination of colors you choose to use. Note: If you look at the Master Chart with all 25 Octagons, you will notice that Octagon "C" and Octagon "S" have the same motif done in different colors. Octagon "S" does not use any metallic thread. You will notice how different the same motif can look. In the model, the smyrna cross variation border around the octagonal motif is stitched in Anchor #5 Perle cotton, # 926 Ecru. A single strand of Watercolors in a similar neutral shade, such as # 132 Honeysuckle or # 078 Pearl can be substituted. Also you can substitute 1 strand of Antica for the Kreinik braid." Assistant Editor of needlepoint now, Maria De Simone, offers some suggestions for using the hexagon pattern, "Some of our subscribers have picked individual octagonal motifs from Pieces of Eight and made them into greeting cards or small ornaments. They have also used them for the front cover of a needlebook, or pieces of wearable art like a pin or earrings and embellishments for small box tops." She continues, "Obviously, the combinations of colors are endless. Start with a favorite color of Waterlilies, pick a coordinating Impressions and Kreinik #16 Braid or pick an Antica to substitute for the Kreinik #16 braid also." Stitchers interested in receiving back issues featuring the additional octagon patterns for the Pieces of Eight series can order them by phone at (804) 732-9140 or through the magazine website at http://www.needlepointnow.com. Subscriptions can be ordered this way as well. Gail Bicknell, a native of Cincinnati, OH, holds her Teacher Certification in Canvas Embroidery Levels I and II from NAN. She has taught at ANG, EGA and NAN national, regional and local seminars and classes as well as correspondence courses for ANG. 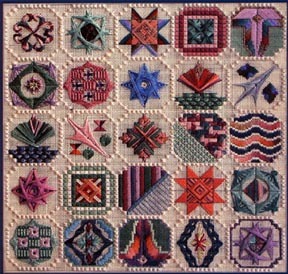 Features written by Gail have appeared in numerous needlework related publications. She currently lives with her husband in Greensboro, NC. Subscriptions can be ordered through the needlepoint now website at http://www.needlepointnow.com. COPYRIGHT NOTICE: These instructions and designs are provided for the personal use of our web site visitors. Any other use be it reproduced or distributed in any other form (including electronic) must have the prior written permission of needlepoint now magazine and Gayle Bicknell.